I defy you to keep easy track of the kills made by Anton Chigurh. His first, with perfect symbolism for a novel and film about law and order and crime and chaos, is of a silly young deputy in a jail where Chigurh is handcuffed. He gets the cuffs around the young man’s neck, and then it is just the work of holding on as the deputy thrashes and thrashes. Chigurh’s eyes are bulging, and the deputy’s death rattle provokes an obscene swoon from the killer. This may be the film’s only vulgarity. 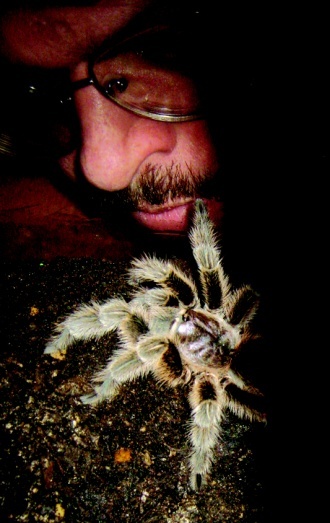 It put me in mind of a documentary I saw about tarantulas. One couple, known honest to god as Tucson Blondes, rolled around and kicked with all sixteen legs at each other and the ground when a gentleman came calling and the lady wasn’t in the mood. The male didn’t make it; the female was largely uninjured. I bet the wild action painting the Coen Brothers organized with black shoe polish and legs trying to get a purchase on the ground matched the markings scratched into the dirt by those frantic spiders. The West Texas land gives of itself almost nothing, but things are perched on it like rocks and soil hostile to life: dirt more like it. It does a good impression of the middle of nowhere. There is a kind of beauty for those passing through. Staying means death. In his introduction, hunter Llewellyn Moss (played by Josh Brolin) takes aim at an antelope and misses. And there we have it. A hunter: but will he prove good enough? G.W. had the iconography of the cowboy more or less right, as did Reagan, but you see immediately that the real thing is as hard, spare and grim as Cormac McCarthy’s writing. The men’s faces are masculine, hard, with unnecessarily thick moustaches. Their bodies are sinewy, thinned, realistic, without decorative musculature or even decorative asses. They are masters at tracking. 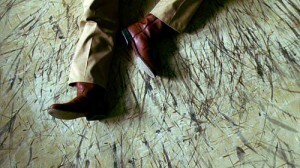 Every man in the film can read the ground, and does routinely like we read a clock. It is all nature, no culture, in the sense that the nature/culture divide intends.